When closed, this curio box looks like a plain container. The advantage to this type of container is that it does not take up much space in storage. Although the outside appears quite simple, it is by no means monotonous. The reason lies in the decorative method of using "panels" by the artisans who made it. 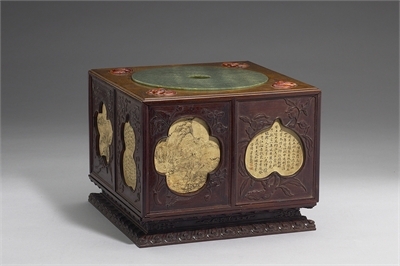 The artifact allows viewers to appreciate its painting and calligraphy, which pique viewers' curiosity about what lies inside. Viewers will be amazed by the wings of the panels that can be pulled out one by one to form a fan-shaped chest. Almost instantly, the static form of the box becomes animated. Combined with the center that can be turned, it looks almost like a windmill about to spin. 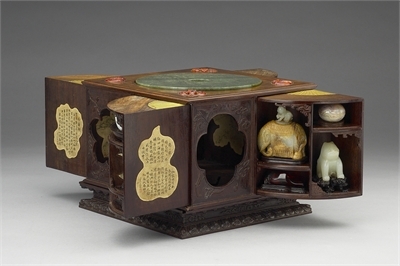 The sumeru mount forming the pedestal of the box is also a storage area. Almost like a modern interior design, this technique of using panels to conceal objects is a perfect match. Such innovation is indeed unrivaled in traditional Chinese craftsmanship. 國立故宮博物院著作權所有 Copyright © National Palace Museum. All Rights Reserved.